TCU has revealed their new uniforms for the team moving forward. The team will be decked out in the nike’s newest football vapor untouchable uniforms. The new look is a nod to the first uniforms of the Patterson era that LT helped make iconic, with the geometric shapes around the collar. We see that horn pattern brought back on the new jerseys around the neckline but this time a little more realistic. The horns are inspired by the actual horns found on the horned frog. The jerseys will feature HI-Vis numbers encased in a double kiss cut to stand out more. The black horizon stripe on the sleeves is meant to represent the landscape of the players while the white piping tucked under represents the paydirt beneath the surface. The patch on the front of the neckline is tribute to Coach Patterson’s love of music and is shaped in the form of a guitar pick. Finally on the inside of the neckline on each of the different jerseys we will see a different saying to inspire the player every time they put on the TCU Horned Frogs uniform. 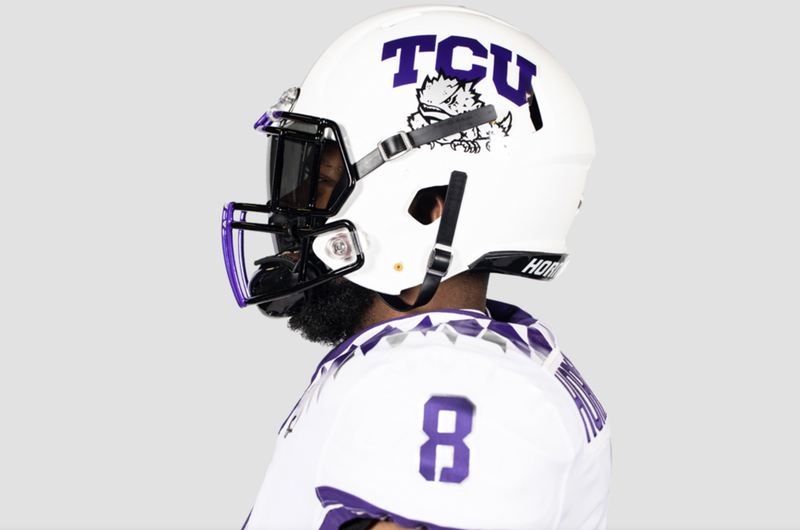 With the new look and the different helmet, jersey and pants combinations TCU will be able to bring a fresh look every time they touch the field.